Last night I read a piece online about a young Canadian woman named Amanda whom I’ve never met. However, I feel changed after reading the digital breadcrumbs she left behind. Another Canadian woman named Shannon McKarney came across Amanda’s tweets and felt compelled to share her story, creating a YouTube video that contains many of the poignant messages Amanda shared during her final months. 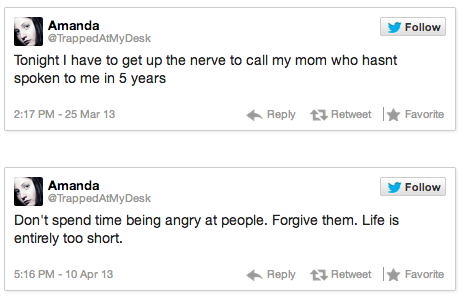 She had a Twitter account, under the moniker TrappedAtMyDesk. 18 January: Results are in: advanced glioblastoma multiforme. 19 January: Deciding what to do with the rest of my life. 21 January: But you look fine. has been said repeatedly. Just cleaned out my desk. Shannon McKarney’s fascination with Amanda’s life stuck with her for months. Amanda went to Central America and Cuba. She tangoed and met new people and ate exotic food and ran along the beach. She returned to Canada only when she was too ill to keep traveling. 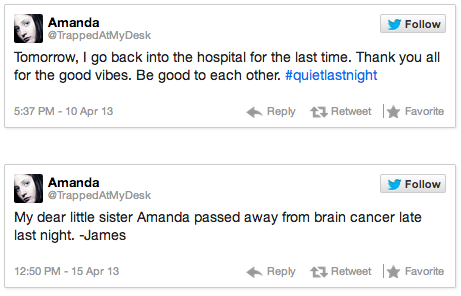 Between 2009 and 2013, Amanda posted 169 tweets. Yet, this young woman left a haunting story behind – 140 characters at a time. Her unflinching courage illustrates the power of the human heart. My take away from Amanda’s story is the need to drop all pretense. Be Yourself. Let go of anger and disappointment. Cultivate forgiveness. Call that person you need to call. Love each other. I’m thinking this morning about this strange girl whose body’s been in the ground for almost a year. An ethereal girl who got on a plane and took herself to places she’d always wanted to go while she still could. A girl whose reaction to a terminal diagnosis was to immediately drop anything and everything that no longer mattered. I love that she left her phone behind, the possession that seems to completely own most young women these days. She put it down and walked into her last chapter without sharing the blow-by-blow with everyone. I love that she gifted the world with tiny snippets of her story, but she left most of it to our imaginations. She didn’t photograph herself living. She lived. She reveled in the life she wanted while she still could. I imagine that everything seemed brighter and more luminous during those final weeks drinking rum and watching the sun sink into the sea. I envision birds that were an indescribable shade of blue. I wonder if every face she encountered shone with light. I see the sky streaked with a smattering of stars. I imagine her last few nights on the road, drinking up every bit she saw, tasting and embracing everything she could. Since I generally write on this blog only about my personal experiences, including Amanda’s here meant it touched me deeply. Now, there are some indications that perhaps Amanda and her twitter feed were some sort of ‘cancer hoax.’ People have tried to find out more about the ‘real Amanda’ to no avail. For me, even if the story turns out to be complete fiction, it still told a story that contains a core of truth. It rings true to me. I’ve lost several people to cancer just in the last couple of years. Several are battling it as we speak. If Amanda’s story inspires anyone during these times of tumult, that’s true enough for me. That’s all. 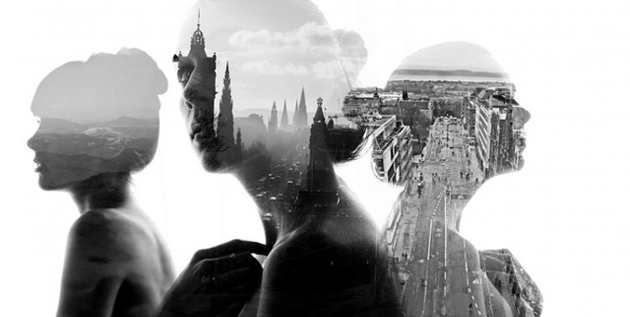 Just Reblogged on my website. Thank you for a beautiful post. What an amazing woman. I don’t often reblog other people’s blogs, but this one was beautifully written and got to me. I don’t know if it’s because it’s Easter and I had to stay home with my son who wasn’t feeling well today and not spend the day with family, or because I constantly think that life is too short and is passing me by. For whatever reason, I’m sharing this emotional elegy written by Shavawn Berry at Falling Into Wonderland about a girl named Amanda. Thank you. This is WordPress. The theme is Ever After. You can check out all their themes at WordPress.com.